A prescription-only pill to help people quit smoking has received draft approval for use on the NHS. Varenicline (Champix) is the first non-nicotine drug developed specifically to help smokers give up, and was licensed in the UK in 2006. The National Institute for Health and Clinical Excellence said the drug should normally be given alongside counselling and support. 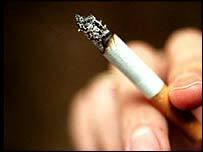 Final guidance is due in July - the start of the smoking ban in England. Varenicline, produced by Pfizer, is unusual as it both stimulates and blocks specific nicotinic receptors in the brain. It is thought that by stimulating the receptor it mimics the effects of nicotine to reduce cravings. At the same time, it partially blocks the receptor preventing nicotine from binding to it, resulting in a weaker response in people who give in to temptation and have a cigarette. Trials have shown the drug was effective after a 12-week course, with 44% of smokers managing to stop. This compares with 18% of those given a placebo and 30% of those taking another anti-smoking drug, bupropion, which is also available on the NHS. The main side-effect of the drug, which costs about £1.95 a day or £163.80 for a 12-week course, seems to be nausea. The charity Action on Smoking and Health (ASH) had issued interim guidelines following discussions with the Department of Health to help health professionals prescribe the new treatment, while awaiting a decision from NICE, whose draft recommendations are still subject to appeal. A spokeswoman for NICE said: "Having looked at all the evidence, our independent committee have concluded that varenicline appears to be a good way to help people who want to quit smoking. "The draft guidance also recommends that varenicline should normally be provided in conjunction with counselling and support, but if such support is not available, this should not stop smokers receiving treatment with varenicline." From 1 July, there will be a ban on smoking in virtually all enclosed work and public places in England. Experts have predicted a surge of smokers attending NHS stop-smoking services in the run-up to the ban. Nicotine replacement therapy and buproprion - an antidepressant that has been found to help smokers quit - are already widely available on the NHS. Amanda Sanford, spokesperson for ASH, said the NICE guidance would push PCTs to offer varenicline as an alternative. "It's important smokers are offered a choice as some people have tried nicotine replacement therapy and been unsuccessful. "There's no reason varenicline can't be offered as a first-line treatment as it has been shown to be cost-effective," she said. Dr Alex Bobak, a GP in Wandsworth, south London, and a smoking cessation expert, said more people were asking about stopping smoking in the run-up to the ban. "It's tremendous we can offer this option for smokers who want to quit. "I've been using [varenicline] an awful lot and people have been asking about it."